The California Maternal Quality Care Collaborative is a multi-stakeholder organization committed to ending preventable morbidity, mortality and racial disparities in California maternity care. CMQCC uses research, quality improvement toolkits, state-wide outreach collaboratives and its innovative Maternal Data Center to improve health outcomes for mothers and infants. CMQCC was founded in 2006 at Stanford University School of Medicine together with the State of California in response to rising maternal mortality and morbidity rates. Since CMQCC’s inception, California has seen maternal mortality decline by 55 percent between 2006 to 2013, while the national maternal mortality rate continued to rise. 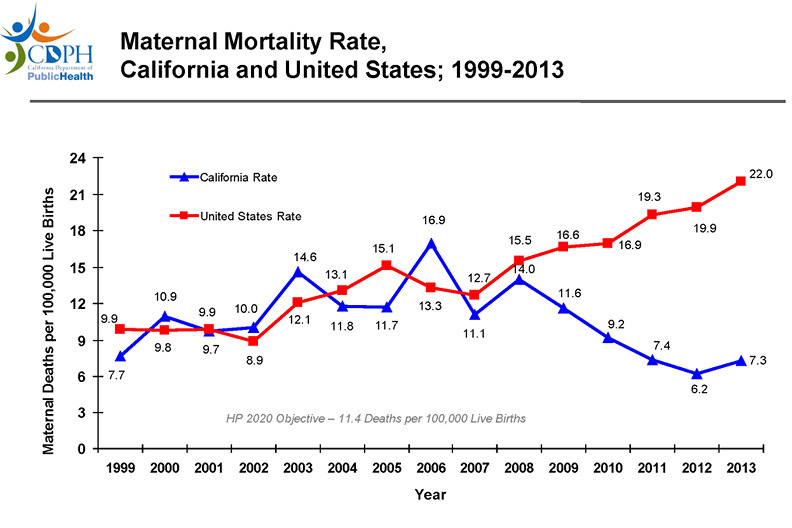 SOURCE: State of California, Department of Public Health, California Birth and Death Statistical Master Files, 1999-2013. Watch this video to learn more about the CMDC.